I am a cheesecake girl. Like, if I were on death row and had to pick a last meal it would start and end with cheesecake. Not that I have thought about that possibility or anything. Whatever. And since I am scared of making an actual cheesecake I stick with cheesecake bars. So I made eat-with-your-hands cheesecake. Actually it’s caramel cheesecake. And actually-actually it’s all on top of a brownie bottom. Because brownie bottoms are where it’s at. 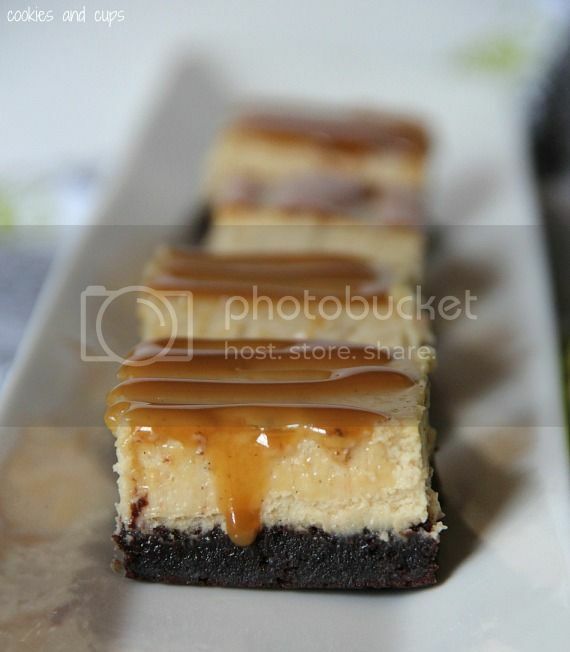 So yeah, Brownie Bottom Caramel Cheesecake Bars. Do it. All you need to to do it whip up a brownie crust, starting with a box of brownie mix and a few other ingredients. Easy. Then mix up your cheesecake layer, and add in some caramel sauce. See? Pour that over the brownie situation and you’re good to go. Bake it and drizzle more caramel. Because it’s dope to drizzle. Did I just say that? Eww. Combine brownie mix, melted butter and 1 egg, stirring until smooth. Spread mixture into prepared pan. Bake for 15 minutes. 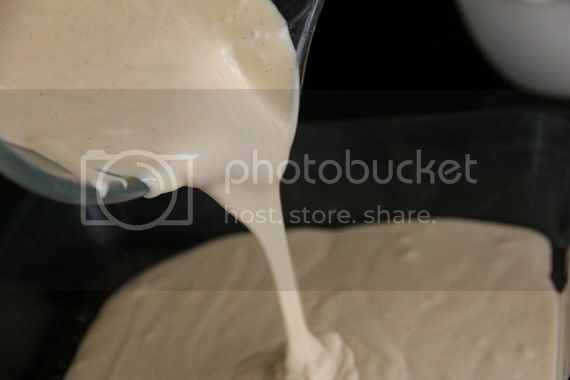 Meanwhile in your mixer, beat cream cheese, sour cream, brown sugar, flour and vanilla until combined and smooth. Turn mixer to low and add remaining eggs, one at a time. 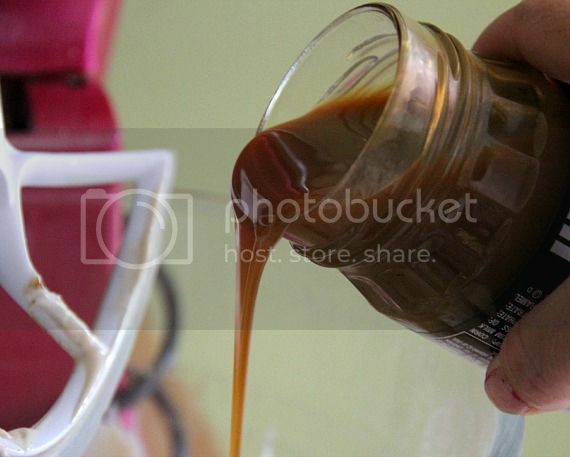 Finally add half the jar of caramel sauce. Eyeball it. Pour this over the hot crust. Bake for an additional 30 minutes until the center of cheesecake is just set. Remove from oven and cool completely. Then refrigerate at least 4 hours. When ready to serve, drizzle remaining caramel on top. I adore cheesecake. Funny cause I used to hate it as a kid. How are you not 500 pounds?!? 😉 I just gained 10 LOOKING at this deliciousness. Each layer of these bars looks perfect!!!!! I’d love to dig into one right now to help me over the afternoon hump at work…. These look incredible! I think that a whole grain version is in order. 🙂 We don’t have brownie mix here anyway so I’d be forced to make a homemade version. Nor we do have caramel sauce! Or proper cream cheese while we’re at it. I’ll stop whining now. And there’s no need to be afraid of cheesecake. Even if it cracks, you can cover it in ganache. Problem solved! My mouth is literally drooling. Well, not literally, because that would be gross but these look AMAZING!!! Now I know why I read your blog every chance I get! Holy crapola, these look amazing. I love cheesecake too. In fact, I’ve not made a cheesecake in a while now though. My partner loves cheesecake too and at one point, I used to make 1 or 2 every week just for him. Definitely going to make these for him and then see if he demands I make it once or twice a week, hehe. Thanks for sharing. Oh boy…these look dangerous..and fabulous! wow, these look so decadently amazing!! i’m a huge cheesecake fan and with brownies is even better!! Holy dessert! I am in love! I love the THICKNESS of each layer…perfect! Oh dear god those look amazing! I haven’t had cheesecake in a while… these might be calling my name! “It’s dope to drizzle.” You really should be a rapper. Oh my goodness! My favorite things all in one sublime treat! AH-mazing! I can’t resist cheesecake, especially when you throw chocolate into the mix! I am terrified of making an actual cheesecake too Shelly!! Too much work and mine would never taste or look like my mom’s famous Chocolate Chip Cookie Dough Cheesecake! Sigh. But cheesecake bars? I could totally manage. I’m saving this recipe. I have some cream cheese to use! Yes, yes, and more yes. I live and die for cheesecake also. Brownie bottom cheesecake smothered with THE BEST sundae condiment EVAH? I will do bad things to have this. I’m totally a cheesecake bar type of girl too! A bar is just so much more attainable! Delicious looking dessert! Amazing, Shelly, just amazing. My husbands two faves are cheesecake and brownie and the caramel just makes this even more top-notch. These are wonderful! Cheesecakes are a little scary, but I love to bake them. These bars would be quicker and just as tasty, plus they have BROWNIES, so they are already great! This looks incredible. Soooooo printing and baking. YUM. Okay I am totally going to have to make these! I just so happen to have a brownie mix and caramel in my kitchen calling my name!! This is it!! You could bake a cheesecake with no problem due to all the luscious creations you share here. Dope to drizzle? Right on! 🙂 Thanks so much for sharing this ~ can’t wait to try it. I am all over anything with a brownie bottom. That and caramel have me drooling like crazy right now! This is amazing! Two of my favorites in one! This has got to be a perfect combination. And adding the caramel sounds delicious! These are so perfect for a party – slice ahead and no messy plating in front of a crowd. Dope? Really?? So carmel is fantastic…any ideas for this recipe that includes peanut butter? EHH? You are a true genius so I am sure you can do it…please try..PLEASE????? Is anybody else having trouble with the Pin It button? I have tried to pin 2 different things and have not been able to. Help! I think it was just a problem with Pinterest.. the button seems to be working now…let me know if you still have troubles! Cheesecake you can hold and eat a whole pan of. I like. My boyfriend is drooling over your pictures from the other side of the couch…haha! I iwll definitely be saving this recipe! I have been away but am glad to see that NOTHING has changed here at Cookies & Cups! I adore cheesecake too and adding half a jar of caramel sauce to the batter and putting a brownie layer on the bottom just takes these bars over the top! I want one RIGHT NOW!!! Oh yes! Caramel. Cheesecake. Heaven. dang. you`re a genius. i don`t know how you do it! But, seriously. These are what dreams are made of. I need these in my real life. Not just my internet life. Uhm, hello delicious cheesecake-brownie hybrid! I love cheesecake and I cringe to think that, without blogs, I’d probably still be munching on classic plain cheesecake oblivious to all the other delicious thinks you can do with cheesecake. Like make it with a brownie bottom! Yum! Good god these look amazing. Swoon! I’m making these now. I’m assuming it’s 3 eggs in the cheesecake? Since I used one of the 4 for the crust? Eek! These look sooo good! Could I use a brownie recipe from scratch for the crust?? Would I need to make any alterations or omit anything if so?? Thanks so much…you are so creative! Soooo sinful, but going to make them anyways lmao…. I noticed that the brownies aren’t suppose to cool at all, last time I tried that with a normal cheesecake, the weight of the cheesecake caused the brownies to “bowl” in the middle, leaving it concave and ugly, you didn’t have this problem with these? i can already tell by tasting the cheesecake batter that these are going to be amazing! 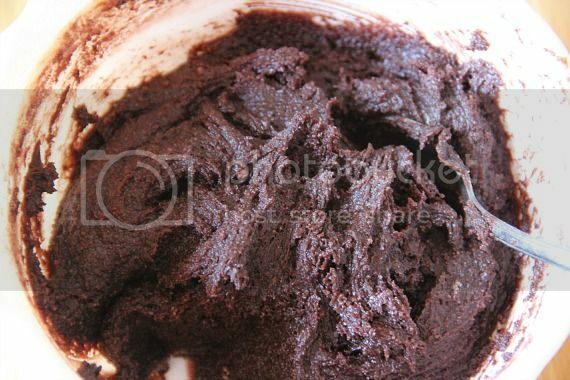 This brownie mix is so good and extremely inexpensive – like 30cents! I doubled it so that it would work for the 9×13 pan. Can’t wait…Thanks so much! I made these Wednesday for a church meeting and we just finished them tonight. They tasted AMAZING! They were so yummy! I will most definitely be making these again. The only problem I had was getting them out of the pan. Actually, it was a HUGE problem. I’m not sure if I didn’t use enough cooking spray or what, but it was a little embarrassing until we tasted them and realized the taste was worth the work. I think a couple of people were a little afraid to try them at first, but everyone ended up taking more than one piece. Any ideas on how to make them easier to get out of the pan??? These are amazing like ever other recipe I’ve tried for this (my favorite) blog, however my crust came out pretty hard and difficult to cut. I was thinking of adding another egg, thoughts? I made these just because I had the extra time today and my family was extremely happy! They were delicious. 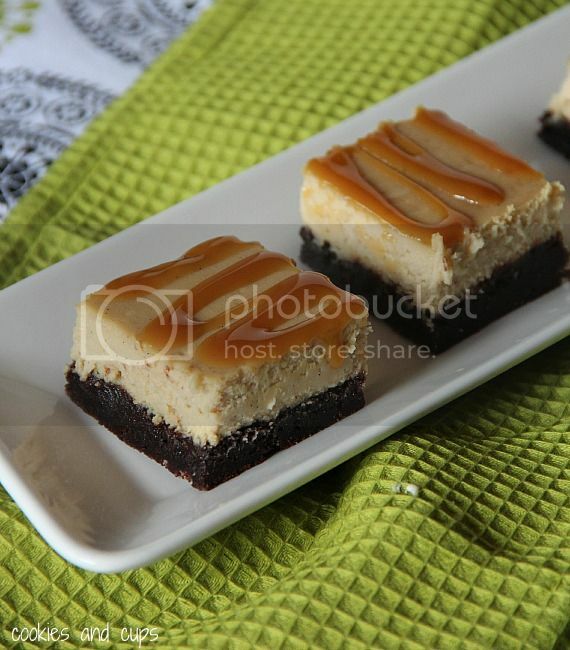 We loved the combination of the brownie, cheesecake and caramel. Will definitely make these again. Thank you for another great recipe. Hi Shelly! I’m going to be making these for Christmas Eve. My concern is cutting these & still having them look as beautiful as yours. Like one of the most recent commentators I’m afraid it’s going to be a mess! Do you have any advice/helpful hints?? I hope to see a response soon, because I’m looking so forward to making these!!!!! Thanks so much for getting back to me Shelly! Can’t wait to make these & my nieces & nephews are probably more excited than me! Happy Holidays Shelly! I made these today, one of my boys wanted brownies and the others wanted cheesecake, so this seemed like the perfect choice. They are sooooo good and my boys and hubby are picky when it comes to their brownies. I used my own brownie base but love the cheesecake top. THanks so much for sharing. WOW!, MINE CAME OUT TERRIBLE! THE BROWNIE MIX, NEVER GOT MOIST ENOUGH AND IT STUCK TO THE PAN..HAD TO THROW IT ALL AWAY. SOMETHING WAS MISSING?